Every year, tens of thousands go to Tijuana, Mexico for dental care. Why? Because it costs a third of what they would pay in the US. This is reason enough to visit TJ, but for freelance contractors, there are even more incentives to get their dental work done in Tijuana. While we talk about cosmetic dentistry, we mean any dental work used to improve the appearance of the teeth and give you a better smile. It might include small treatments as whitening or cleanings to more extensive treatments to like smile makeovers, through veneers or crowns, and even the replacement of teeth with dental implants. Today, having a great smile means a lot to boost you self-esteem, and confidence. It can aid in your profession, and even help with personal relationships. The biggest problem with cosmetic dentistry is that it is expensive, and often time insurance won’t cover it at all. But that brings us to reason for this article, dentistry in Mexico is very in expensive, compared to the US, offering savings of up to 70%. There are more than just financial reasons for choosing s dentist in Mexico as a destination for cosmetic dentistry. You might be thinking that because of the low price, the quality of the dental treatments won’t be good, but that’s not the case. In Mexico, you can get dental treatments from dentists with many years of hands on experience. 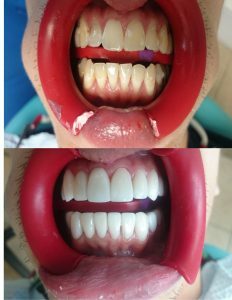 Our Tijuana dentists are all board certified, so you can be sure that when you visit a our dentists in Mexico, you’ll get a good quality dental treatment. Should you have any scepticism about it, we urge you to ask around, so you can see what our patients say about their experience. Already mentioned above, but really, for 1/3 the price, you can get the smile you have always wanted. That is a savings of thousands of dollars. Think about it, wouldn’t you like to have the smile that can make a drastic change in your appearance? The cost is now not as big a factor. And in our dental clinics, we can even do same day placing of up to 8 crowns, because we have our own in-house dental lab.